I was wandering around NYC in the late afternoon today, taking a break from work. Wandered my way down a rathole, into the nether regions of the roads behind Belleview Hospital. Only way out without retracting my steps was to go through the hospital. On the way out, I noticed the old facade of the hospital, with some beautiful stonework. Of course I took a photo, being careful not to include any faces in the photo. Immediately a security guard came over and told me "No photos! You'll have to delete any photos you've taken!". I refused, of course. The Supreme Court has ruled that you have a right to take a photo from public property. 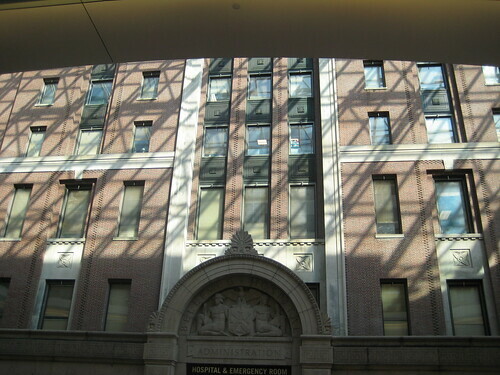 Bellevue Hospital, being owned by the city, is of course public property. He called for his supervisor, an older and presumably wiser gentleman. The supervisor gently explained to me (obviously an ignoramus hick from out of town but I repeat myself) that the hospital board has a policy prohibiting photos. I didn't bother explaining to him that the hospital doesn't rule on the Constitution, nor can it take away a basic civil right. I explained that I respected people's right to privacy and didn't include any faces in the photo. He explained that if I did it again, he could confiscate my camera, but that I could keep my photo. No point in explaining the law to him; I just shook his hand, said thanks, and left. So, no, he still thinks he can threaten peaceful people, but since he respected my civil rights (since I knew them), no harm done. The moral of the story is: know your civil rights, or you WILL lose them.